The dragon is power and strength. How can it not be? Flying, freaky, fiery breath to incinerate obstacles and adversaries–this mammoth beast is viewed not only as a powerful entity, but one of benevolence and wisdom in China. The Dragon was actually used as a symbol for the Emperor for a long time, and even today there are idioms such as, “Hoping your son will be a dragon.” The creature is not the miserly hoarder of English legend by any stretch of the imagination. The koi carp–the only one of these three animals to actually exist outside of legend–represents fortune and good luck. If I had to pick an animal to embody my prosperity I think I’d select something a bit more aggressive or intimidating, maybe an animal known for its intelligence–the fox or a bird of prey, a wolf even. The owl is out since in China it’s viewed as a bad omen by many people. And perhaps the wolf is out, too. There’s a term “se lang” (color wolf) that basically translates into English as “pervert.” The fox, on the other hand, already has a special place in Chinese legends. When an animal lives long enough, gains enough wisdom, or is given enough power (all depending on the telling of it) the animal can turn into a human. In some stories they’re immortal and in others they’re sort of like spirits or demons, but the most famous of these unique animals is the Fox Lady. She shows up in stories, pop culture, and even in a recently released Chinese movie I saw at the theater. The other lucky animal to have been granted a human form is the snake–again, viewed by many in Asia as a wise and noble creature. Anyway, at least the animal some credit for their good fortune each year ( there’s a phrase that goes “nian nian you yu,” every year there is some, that refers to the harvest and the fish–Yu–at the same time) is a real one. You can see the multi-colored fish hanging in store windows, neighbors’ doors, inside buses, and even in taxis. Maybe that fact, that it’s real, gives the superstition some girth, something for belief to get behind. Or maybe it’s the koi carp because it’s a prosperous sea creature that’s been fished and bred in this country for thousands of years and people just decided on it by a majority vote. Who knows? But the phoenix, like in Western tales, is life renewed. Chinese legends say it is the balancing force of yang, the dragon. As yin, it evens out the field and acts as a counter weight. Life and death, good and evil. Seen in times of new beginnings, this animal has to be positive. No matter the path before or even how the path ended, rebirth symbolizes hope, a future forged from ashes left when a fire wore itself out. All fires run their course, some longer then others, and some have enough force to alter the landscape irrevocably. But all fires fall to cinders and ashes, and I’ve heard that ash has a way of revitalizing the soil by bringing nutrients back that were scorched away. Whether it be flowers or a phoenix, life does return, reborn from the very elemental power that wanted so much to wipe it from the face of the earth. My first year in China is nearly at its end, but the thought or returning home is still far away. Fires have indeed burned and charred some of the terrain, and recent blazes still rage, but along the edges where the ash has settled life is already being renewed. This type of paper art can be seen everywhere in China. I have a friend who is particularly good at making these. 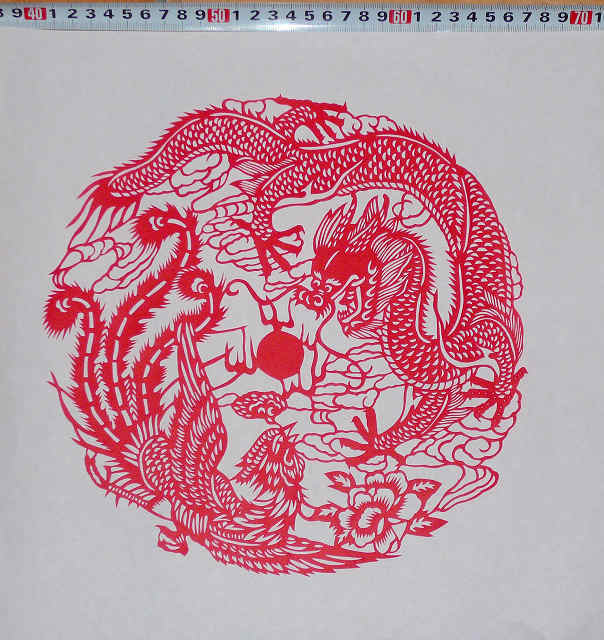 This one is of a Dragon-Long-and a Phoenix-Fenghuang. Together they symbolize Yin and Yang.